They’ll need something to listen to on their ipods while storming Wall Street. 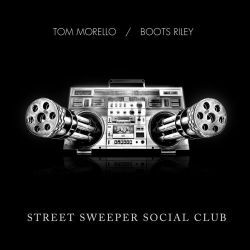 Street Sweeper Social Club, the band formed by Tom “The Nightwatchman” Morello and Boots Riley, is now streaming their whole album on their MySpace page. There is only one word for Street Sweeper Social Club, and that is awesome. Like Morello’s Nightwatchman, this is revolutionary music: it fills you with energy and the desire to fight back. It’s music fueled by righteous anger, by the strength of the oppressed – and if art can ever make a difference, this is the art that will. Personal favourites so far: 100 Little Curses, which is full of that satire and venom Morello mentions, and The Oath, which is about the personal choice to not take any more crap. I also quite adore Promenade. This kind of art is exactly what the world needs today: powerful, angry but also intelligent. This is art that speaks to our common humanity, to our sense of justice, to our sense that things are wrong and need fixing. Its attitude is not style, it’s substance – it doesn’t pretend to be revolutionary in order to sell, it simply is. It’s the kind of art that gives me hope. No matter how powerful the representatives of the system are… there are people who will fight, and maybe one day enough of us will start working together to start kicking some real arse and cause some real change. The Nightwatchman’s first album, One Man Revolution, is without question my very favourite album in the whole world, and gives me strength to continue the fight. Street Sweeper Social Club’s first album is, to me, on the level of the second Nightwatchman album: not my number one favourite, but still incredibly awesome and important. Previous PostEuropean Elections: this is the time to speak up, not to mumble.